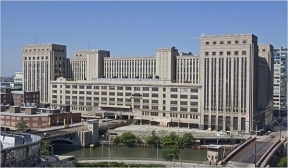 Mayor Rahm Emanuel, Alderman Danny Solis, and the Chicago Department of Planning and Development, last week shared their plans to move forward with the “long-overdue” rehabilitation of Chicago’s old main Post Office building in the West Loop. Closed by the U.S. Postal Service in 1995 and acquired by International Property Developers North America Inc. in 2009, the 2.5-million-square-foot post office and annex buildings have been vacant and deteriorating for decades. The city has notified the current owner of DPD’s intention to issue a Request for Proposals to identify a company to take over development of the site. The qualified developer would be required to fund the city’s acquisition of the property. The RFP will be released this spring and the process would conclude with the selection of a developer this summer. Concurrently, the city is moving forward with seeking control of the 11.1-acre site through the eminent domain process. The Community Development Commission will consider both actions on March 8, before they move to the City Council for approval. No city funds will be used to acquire or redevelop the building. 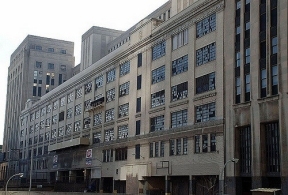 Depending on how the site is developed, the building could be eligible for historic tax credits and Class L treatment. In July 2013, City Council approved a $1.5 billion redevelopment plan that included 2,150 residential units in the building and thousands of additional units, hotel rooms, and commercial spaces on adjacent land. Initial occupancy for the first phase of the project was projected for early 2015, however no significant redevelopment work has been completed to date. The initial phase was anticipated to create up to 10,000 permanent and temporary jobs.